"Questions of love, like those of string theory, don’t have answers. In 'Anomalisa', Charlie Kaufman presents one possible answer." Will love finally work the next time around? In the calm between one lover and the next, this is the question we ask ourselves. Will we ever achieve the peace promised us by our favorite movies? Questions of love, like those of string theory, don’t have answers. In Anomalisa, Charlie Kaufman presents one possible answer. Though it was jointly directed by Kaufman and Duke Johnson, the film is in most regards a Kaufman piece. With a surreal mindfuck storyline that doesn’t distract from its strong emotional message, Anomalisa follows in the vein of the auteur screenwriter’s other work, including Eternal Sunshine of the Spotless Mind. In the film, Michael Stone (voiced by David Thewlis) is a British customer service specialist who finds himself in Cincinnati, Ohio to do a talk. This is a bored man: nominally successful but inexplicably empty. This man is you. Though he is married, he is hung up on a former lover who lives in Cincinnati. A spontaneous meeting between the two doesn’t go well and furthermore, something is off – she has an ugly voice. Namely, she has a man’s (Tom Noonan’s) voice. But it’s not just her. Literally Everyone Else – Stone’s wife and son, the taxi driver, the bell boy – have the same voice. No wonder he doesn’t have the will to live. That night, however, he hears something strange and beautiful. A voice different from Everyone Else’s. It comes from Lisa Hesselman (voiced by Jennifer Jason Leigh). Stone’s life changes instantly. Since she’s coincidentally a fan of his, he easily seduces her. One night is all it takes for them to fall passionately in love. Their romance, however, is soon challenged by factors both real and imaginary. Anomalisa’s premise answers a “what if” question – what if everyone besides you and your significant other were the same person, or at least had the same voice? It would be a nightmare. And your lover would be so much more indispensable. The film’s premise is strong because it brings to life a life-or-death scenario. 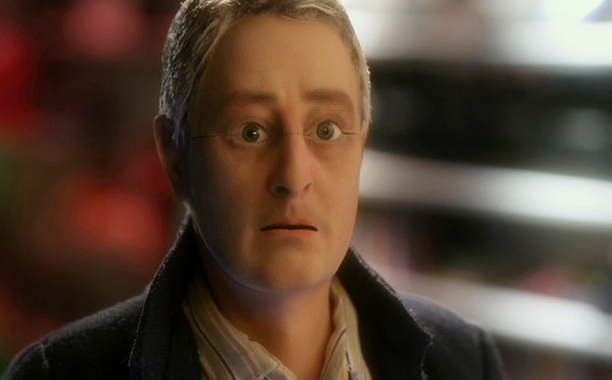 The premise goes well with Anomalisa’s animation style. It’s a choppy kind of puppet stop-motion that does not attempt to hide the gaps between movement. In a meta scene that I won’t detail here, one character even wonders if he is a puppet or a human. At the same time, the puppet characters’ expressions look human even under extreme close-ups. The animation is at the same time realistic and totally unreal. Like most animation films, Anomalisa keeps a respectfully short run time of 90 minutes. However, its deliberate pacing and plain dialogue makes it take work to watch. It takes its time to unravel the set-up as it takes us through the details of every mundane conversation Michael has. While this technique really hits home the glaring emptiness of Stone’s life, it also doesn’t let up for the rest of the movie. Conversations still drag and more importantly, lack heart. The couple’s passion would be totally unbelievable if not for the film’s cinematography, which forces attention on the characters’ endearing physical details, including their childhood scars. Because of this, the film would likely have worked better as a half-hour short. While it hosts the unexpected twists and turns that are Kaufman’s signature elements, there are ultimately too few to keep the film going for its entire run-time. Its main attraction remains its distinct premise and solid animation. It will please fans of Kaufman and animation and provide food for thought for the more patient filmgoer. From its depressing set-up to ambiguous ending, Anomalisa’s plot begs post-viewing discussion about one of life’s most interesting questions. If its runtime were less diluted in terms of content, it would be a veritable masterpiece.